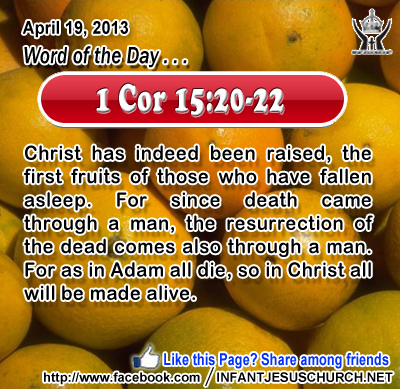 1 Corinthians 15:20-22: Christ has indeed been raised, the first fruits of those who have fallen asleep. For since death came through a man, the resurrection of the dead comes also through a man. For as in Adam all die, so in Christ all will be made alive. Heavenly Father, because of your grace and the resurrection of Jesus from the dead, we know we will see you face to face. Help us now, however, to live that resurrected life being more like Jesus today than any day ever before. In the name of Infant Jesus we pray. Amen. 52The Jews then disputed among themselves, saying, "How can this man give us his flesh to eat?" 53 So Jesus said to them, "Truly, truly, I say to you, unless you eat the flesh of the Son of man and drink his blood, you have no life in you; 54 he who eats my flesh and drinks my blood has eternal life, and I will raise him up at the last day. 55 For my flesh is food indeed, and my blood is drink indeed. 56 He who eats my flesh and drinks my blood abides in me, and I in him. 57 As the living Father sent me, and I live because of the Father, so he who eats me will live because of me. Jesus chose the time of the Jewish Feast of Passover to fulfill what he had proclaimed at Capernaum - giving his disciples his body and his blood as the true bread of heaven. Jesus’ passing over to his Father by his death and resurrection – the new Passover – is expected in the Last Supper and celebrated in the Eucharist or Lord's Supper, which completes the Jewish Passover and anticipates the ultimate Passover of the church in the glory of God’s kingdom. When the Lord Jesus commands his disciples to eat his flesh and drink his blood, he requests us to take his life into the very center of our being. That life which he offers is the extraordinary life of God himself. Do we hunger for the bread of life? Loving Infant Jesus, you nurture and sustain us with your very own presence and life-giving word. You are the bread of life - the heavenly food that protracts us now and that produces everlasting life within us. May we always hunger for you and be satisfied in you alone.